Don’t be misled by the “studio recordings from 1958” label on the recently unearthed Luther Allison recording, or the liner notes for that matter. 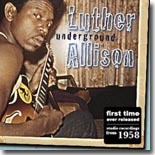 Underground (Ruf Records) was not recorded in 1958 as indicated by the initial publicity (which has since been corrected) and the notes by Art Tipaldi (which have not), but instead probably was recorded closer to 1968, just as Allison was getting ready to release his Delmark debut, Love Me Mama. At the latest, it was done between the Delmark and Motown sessions of the early ’70s. Underground was produced by Bobby Rush for Wonderful Records, and some longtime fans can recall Allison selling the album off the bandstand at his club dates. Allison played in Rush’s band for several years in the late ’50s and played on one of Rush’s first singles, around the 1958 date. Rush also played bass on the session, which also includes Bobby King on rhythm guitar and Robert Plunkett on drums. The set, clocking in at around 25 minutes, consists of eight classic Chicago Blues tunes. Allison’s version of Freddie King’s “Hideaway” is excellent, even without the liner note claims about this possibly being the first recorded version (King recorded his version in 1960). Next up is a funky take on Sonny Boy Williamson II’s “Don’t Start Me Talking,” featuring some tasty slide guitar from Allison. Junior Parker’s “Drivin’ Wheel” is next up, followed by “Cut You Loose.” One piece of evidence that definitely refutes the earlier claimed date of the session is the presence of Ricky Allen’s “Cut You Loose,” which wasn’t released by Allen until 1963. These recordings were stored at the house of Fannie Mae Allison, Luther’s wife, in Chicago, for years until they were discovered recently by Luther’s son Bernard. He and Thomas Ruf have done a great service getting this album out for the public to hear. It stands up very well to his early recordings and gives a peek at what was to be in the future. Luther Allison is still missed very much by his legion of fans, so Underground will please them immensely, regardless of when it was originally recorded.